The U.S. State Department said on July 12 that over one million Chinese visa applications had been processed in the 2012 fiscal year, a 43 percent increase from 2011. The increase is the result of measures taken to attract more Chinese visitors, including expanding staff and reducing waiting times at U.S. embassies. Besides greater efficiency, might this in part also be a result of China's sluggish growth? After the financial crisis, where China did not suffer as much as others and then launched an RMB 4 trillion stimulus, there was a wave of returnees, and I'd expect, a relative decrease in visa applications to go abroad, including to the US. This is just total conjecture. I'd welcome info from someone more informed. We are having a cool conference in Beijing this coming weekend, October 29-30, 2011. Day-1 will be fancy show at the Beijing International Hotel. The occasion is the 10th anniversary of China's entry into the World Trade Organization (WTO). In attendance will be several WTO representatives, officials from various governments, international trade lawyers (my favorite), business execs, and scholars. On Day 2, we will move the meeting north to the campus of the University of International Business & Economics, and turn our attention to 11 working papers produced through the RCCPB's Initiative on China and Global Governance. We've had a great response rate so far, with lots of folks registered. You can still try and reserve a spot, but if not successful, you can at a minimum get copies of the related working papers. We're proud to have several co-conspirators in this venture. Our co-organizer is the University of International Business & Economics China Institute for WTO Studies, and Caixin Media is our exclusive Chinese media partner. Of course, anyone from the media is welcome to attend, cover the event, and interview the participants. Searching for Owen Lattimore - found. As loyal readers may recall, I was in Shanghai with a group of Indiana professors, businessmen, and journalists. Among the group was Greg Lattimore Andrews, managing editor of the Indianapolis Business Journal and great nephew of famed China specialist Owen Lattimore. Using information provided by some Shanghai history buffs, including Paul French, we tried to find the office of Arnhold Brothers, where his uncle worked for a few years in Shanghai. We didn't find the exact address that day, but we thought we had found a building that could have been where Lattimore worked. So we took a picture and posted it to this blog. Turns out we were wrong, but only by a block or two. 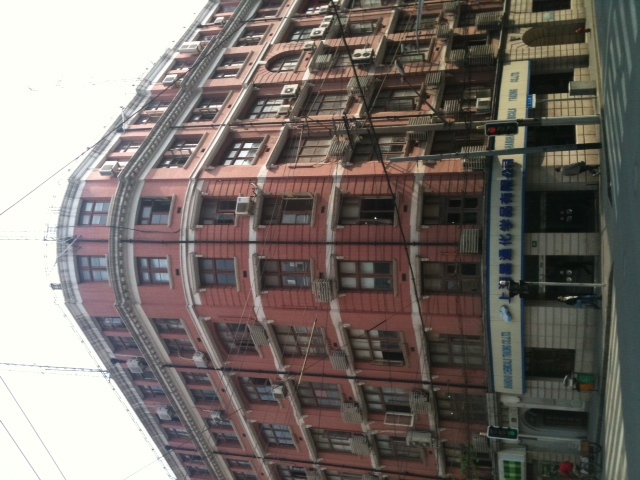 Paul French, host of the blog China Rhyming, followed up and found the right building, which is at 320 Jiujiang Road. Case solved! Many thanks to Paul and others who helped with the detective work. High Speed Trains: Not So Fast! The Wall Street Journal, People's Daily, and others are reporting that China has decided to reduce the maximum speed of its high-speed train fleet to no more than 300 kilometers an hour. Doing so will save on energy and allow the tickets to be cheaper. The changes are to take effect July 1st. If so, that means I was among a privileged class of riders to enjoy travel at warp speed. Last month I took the train from Hangzhou to Shanghai, and we cruised along at a comfortable 346 km/hour. As we went whizzing by buildings, fields, and roads, more than one person in my group worried about what would happen were we to jump the tracks. Simple: we'd be toast, and it'd be extremely messy. I immediately thought of the movie The Fugitive (1993). In an early scene of the flick, Harrison Ford, having been wrongly convicted for the murder of his wife, is traveling by bus to prison. Some other convicts try to escape (the old foam bubbling out of the mouth trick), and the bus crashes, falling down an embankment and ending up on railroad tracks. Before long a train comes along, and just before it rams into the bus, Ford jumps to safety. He then scuries down a hill in his shackles with the train tumbling toward him. He gets out of the way just in the nick of time. If that plodding locomotive had been a high-speed Harmony #1, as they all are called in China, things wouldn't have been so harmonious, Harrison would have been crushed, and the one-armed man would have gotten away with murder! Thank heavens the Chinese high-speed trains are on raised platforms where no car, bicycle, scooter, 3-wheeled ag vehicle, tractor, or prison bus can go. Moving to China: An American Trend? CNN has posted a very good story by Katherine Dorsett about the emerging trend of Americans moving to China for work. Aside from being cited (thanks! ), I provided some background info for the story. One piece of data I had a hard time locating is the actual number of foreigners, including Americans, who have work visas in China. I looked through some Chinese statistical yearbooks and the website of the Ministry of Public Security, but didn't find anything. I'm sure I just didn't look hard enough. If anyone comes across these figures, I'd welcome you passing them along. One small data point I did find, but not directly relevant to this story, concerns the rapid rise in tourist visitors. That is a 12.5 fold increase in the number of foreigners overall and 7.4 fold jump in number of American visitors. 1. The air. China and Japan are at very different places in their economic development. China's industry is energy-intensive, and that of Japan is not. Japan, like the US and Europe, has moved much of its manucturing, particularly that part which is based on low-wage labor and high use of energy, to Southeast Asia and the People's Republic. Beijing is making major stides in reducing energy intensity of production, yet overall absolute use of coal and oil is continuing grow at a rapid pace. The air doesn't give a whit about percentages and intensity; it only cares about absolute levels. Below are photos from Beijing, Shanghai, and Tokyo on what I would call representative days that I think capture the basic difference between the three. Disagree? Send me your photos. Every day I was in Tokyo I could make out, even faintly, the outline of Mt. Fuji many miles away. In Beijing I rarely notice that the city is, in fact, surrounded by mountains on two sides, with those to the west within a couple miles of the city proper. 2. The temples. Tokyo's temples seem more peaceful and refined than those in Beijing. I visited three near the home of my uncle and aunt, who live in Hyoshi, the suburban home of Keio University. The photo below is typical of them. I could've sat for a long time just relaxing. 3. Economic Policy. During my stay in Japan, I visited with an official from METI, the Ministry of Economy, Trade, and Industry. METI was the center of Japanese industrial policy in the post-World War II era, and for most of that time was known as MITI, the Ministry of International Trade and Industry. I say "was," because although METI still has bureaux devoted to specific segments of the economy and its officials regularly interact with business, it is no longer "pilots" Japan's economy. Instead, it is a highly interested bureaucratic body that can try to informally steer Japanese business with information and limited financing, yet it lacks many of the tools needed to compel compliance. Its heyday is long over, and Japanese officials who work there (I've spoken with several over the years) do not see themselves as economic architects or engineers in the vein they used to be. And amazingly, they don't seem overly upset about that. Now maybe that's the perspective of a non-Japanese speaking China specialist speaking. So please correct me if I'm wrong. The contrast with China is stark. China first learned from its Soviet comrades the art of mandatory central planning. In the 1980's and 90's, as China shifted away from mandatory planning, the target for many Chinese officials was incentive planning in the model of Japan, South Korea, and Singapore. Chinese officials learned a great deal from their neighbors about how to develop and implement industrial policies, and to this day, the Chinese bureaucracy feels it is entirely legitimate for it to encourage, coddle, or mandate micro choices of Chinese companies or the macro environment around them. That does not mean that the policy process is neat and orderly. The development of the policy agenda, the consideration of choices, their adoption, and their implementation are influenced heavily by the preferences of individual political leaders, inter-bureaucratic rivalries, experts, and lobbying by domestic and foreign companies. Nevertheless, I'm struck at how far Japan seems to have moved away from what some call the "coordinated capitalism" approach and how in China the government is still committed to keeping its hands firmly on the wheel. Again, this may largely be a difference of time -- that part of the Chinese economy which is less subject and responsive to industrial policies is gradually growing -- but the side-by-side contrast one sees in traveling between the two countries seems dramatic. 4. Train signs. Beijing and Shanghai (and other cities) are moving quickly to develop subway and train systems on par with those of Tokyo and other major metropolitan cities around the world. I'll admit Beijing's subway, which I'm most familar with, is light years ahead of where it was five years ago, let alone two decades ago. Nevertheless, I'm struck at how the Tokyo train system gets you to absolutely everywhere in the city you'd need to go. Moreover, companies, hotels, and stores all have online directions to their establishments via the trains. Not only do they tell which stop they are near, they say which exit to leave the station, give precise street directions, and estimate the number of minutes to you destination. Here's the online map with directions to METI's headquarters. But the most interesting difference in subway systems are the signs. Yes, advertising has taken over both systems. And in Beijing there are digital ads that spring forth in the tunnels as you pass by at 100 km/hour; they somehow follow alongside your car for a few seconds before disappearing. And yet in Tokyo there are still lots of creative signs posted to remind you to be polite and curtious to your fellow travelers. My favorite sign, below, could be misinterpreted, but its real purpose is to remind passengers that they should turn off their cell phones when sitting in seats reserved for the elderly or women, since they might find your talking with your friends or headbanging rock-n-roll seeping out of the earphones to be upsetting. I welcome my Japan specialist friends to provide further details, including the comments from the upset passengers. Now it may appear that most of the contrasts I pointed to indicate a pro-Japan/anti-China bias. If so, that'll be the first time most people have ever accused me of being anti-Chinese. One thing I missed about China when in Japan was the Chinese language. I've learned a smattering of Japanese phrases over the years, but the reality is that after the basic greetings, numbers below 100, and some food, I can't say very much. Luckily, my family helps me a lot when I'm there, and the scholars and officials I interact with all speak excellent English. But I'm still left feeling somewhat isolated. But on the few moments when I heard Chinese, I felt right at home. When I was eating by myself in a sushi restaurant, I heard these two Chinese businessmen next to me chatting, and it felt wonderful. Then I took my aunt Mikie, my cousin Mie, and her daughter Tesla to lunch at a Chinese restaurant in Yokohama, and I had the best time talking to our wait staff, three lovely ladies from Jiangsu, Xiamen, and Shenyang. It felt like being in China. Until I got the bill -- then I remembered I was in Japan.